The site of this proposed development at 278 College Ave West is currently going through rezoning to permit a 6-unit, 18,500sf back-to-back cluster townhouse. All 6 units have individual access points from the exterior at grade as well interior access points from within the covered 14-stall parking garage. 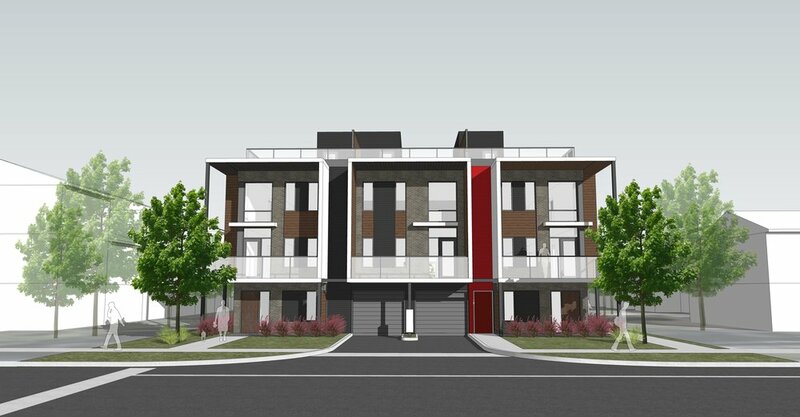 The challenge to accommodate a 6-unit cluster townhouse development along with 14 parking stalls at grade (on a relatively small site) was addressed by raising the main living areas to the 2nd and 3rd floor. This strategy freed up nearly the entire footprint of the building to accommodate an enclosed parking area with only a staircase and an entrance foyer touching down to grade from each suite. All unit types contain 3 bedrooms, 3 bathrooms, 1 powder room, 1 large den along with an in-suite laundry room and a 360sf private rooftop terrace.